Jeff Bezos, CEO of Amazon, became the richest person in the world after Amazon’s Q3 results beat expectations sending the stock 7% higher in after-hours trading. During the quarter Third-party seller services sales grew 40%, in line with the Amazon Web Services (AWS) growth of 42%. Retail products sales grew 22%, accelerating to fastest growth since 2016 Q2. Fastest growing segment was Subscription services at 59%, best its ever been since Amazon started reporting it in 2016 Q1. Other segment grew 58%. Subscription services are believed to mostly consist of revenue from Prime membership payments, while Other is the ads business. Both of these are accelerating - subscription services thanks to the Prime Day in Q3, and ads business since it will eventually become a core pillar of Amazon. Third-party seller services is a proxy to how well the marketplace is doing. Sales in this segment though are recorded as fees received (it is defined as “commissions, related fulfillment and shipping fees, and other third-party seller services”), not actual sales on the marketplace, known as GMV. Third-party sales continue to grow faster than Amazon’s own retail. 40% vs 22% growth this quarter, and similar for the past few years. US e-commerce is growing at 15% so both retail sales, and marketplace sales are outpacing the market. Despite the continuing mentions of competition it doesn’t seem to have any affect on Amazon’s growth. 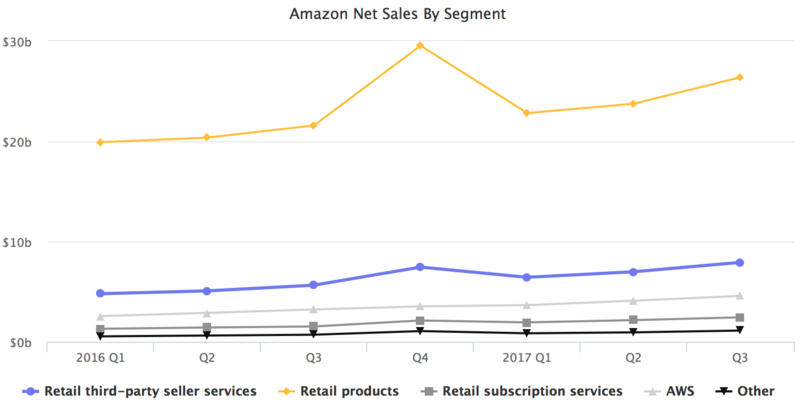 Retail sales is Amazon’s largest segment overall, followed by third-party services, and AWS. Both of these are considerably smaller than retail sales, yet they are growing at twice the rate of retail. AWS has been long attributed as the profit maker for Amazon, offsetting losses from retail operations. But the marketplace is a bigger segment, will soon start growing faster than AWS as it starts to slow down, and is highly profitable too. Compared to other companies in the industry like eBay or Alibaba, it is clear that Amazon’s marketplace has a high margin too. But it is deliberately reported in a way which hides that. When it comes to market-leading companies like Amazon it is as much interesting to hear what they have to say, as what they don’t say. Most key metrics like the number of Prime memberships, growth of Fulfillment by Amazon (FBA), and the marketplace GMV are missing. Not by accident. Amazon recorded a 10th straight quarter of profit. At $256 in net income, and $347 in operating income, resulting in an operating margin of 0.8%.